Protect your plants from these slimy guys! Here are our simple, nonpoisonous options to rid your garden of slugs. Strolling through the garden, you find your hostas looking like Swiss cheese. What could have committed such a crime? The likely culprit: slugs. These slimy, rasp-toothed rascals love moist, shady conditions and lush new growth. These globs of goo are hard on hostas, but they aren’t picky — you’ll find them on other plants, too. 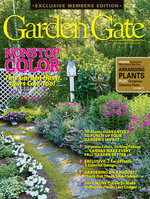 I’ve wrangled a lot of slugs in the Garden Gate test garden and have a few control tips to share. Of course, you can use slug bait. 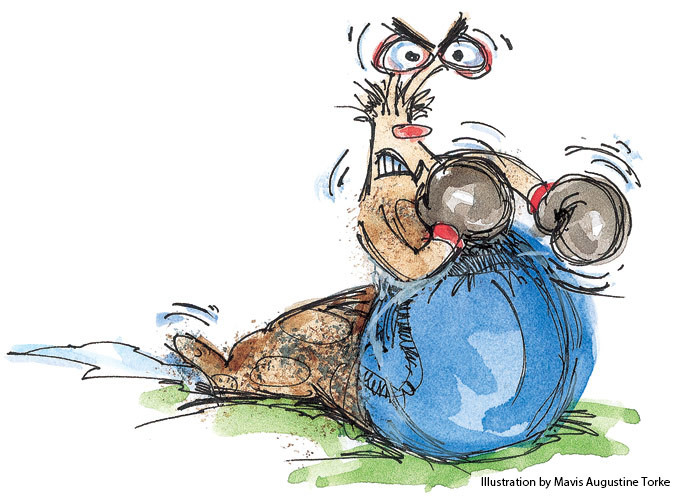 Most of today’s baits aren’t as toxic as the old formulas used to be. But I’d rather stick with nonpoison options when I can. These four low-impact techniques do a good job of keeping slugs away from my most prized plants, and there’s nothing in these methods to harm beneficial insects, pets or people. 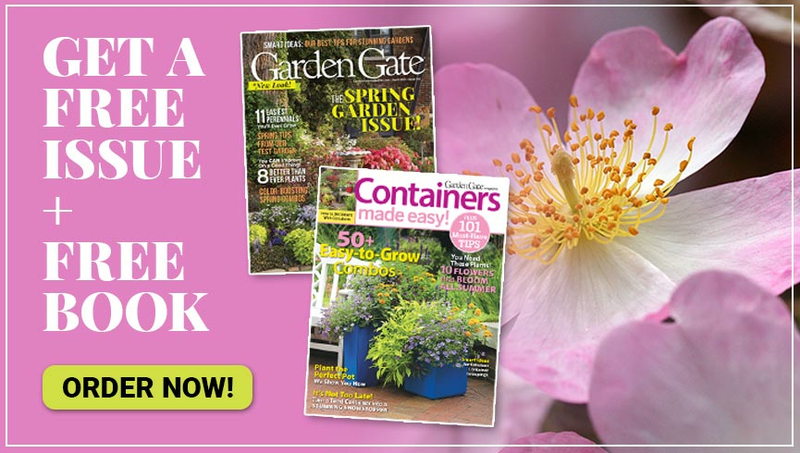 Read on, then head on out to the garden to rid your garden of these slimy pests! Instead of picking slugs one by one from your plants, use food or hiding places to collect them in one place, then drop them into a bucket of soapy water, feed them to your chickens or (eek!) squash them underfoot. 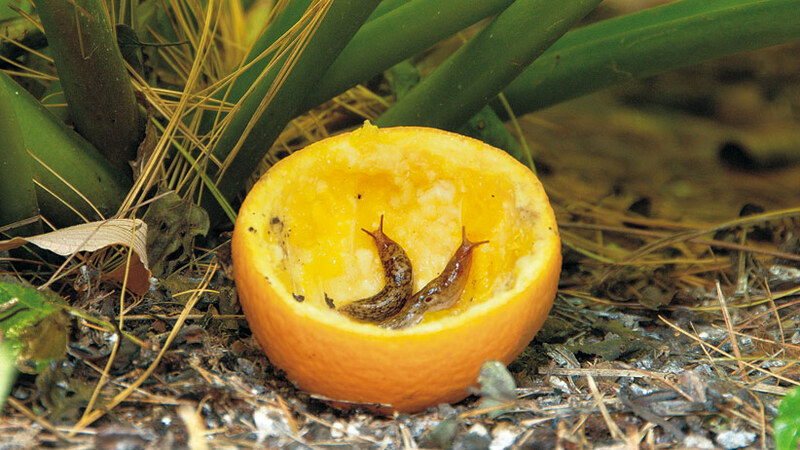 Slugs love citrus! Buy inexpensive oranges or grapefruit (you don’t need the nicest fruit) for slug traps, or use rinds left over after you’ve squeezed some orange juice. Leave the citrus halves near vulnerable plants — the slugs usually hop off the hostas and hustle over to investigate this new offering. Check your citrus traps about once a day so slugs don't have a chance to drift back onto your plants. Throw spent rinds in your compost pile, but remove the slugs first! A board on the ground in a shady spot might not look like much to you, but to slugs, it looks like a great place to spend the day. 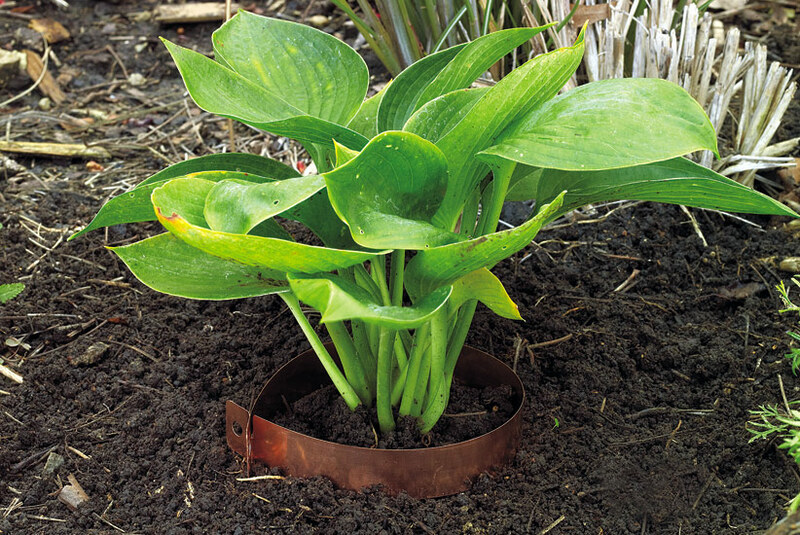 Tuck a 1- or 2-ft.-long piece of board under plants to create a moist, shady hiding place that’ll attract lots of slugs. 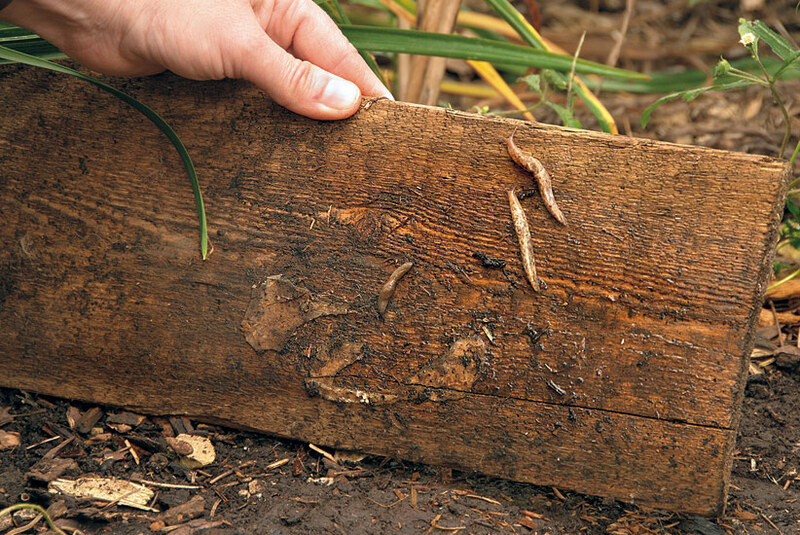 Slugs are active at night, but during hot days, they retreat under mulch, rocks…or board traps. Check the trap in the afternoon, when slugs are enjoying their siesta under your board. Once you’ve coaxed slugs away from your plants, you don’t want them sneaking back on to tender leaves the minute your back is turned. These easy barriers will keep the pests at a distance. When slugs come in contact with copper, it gives them a shock — scientists think that the slug slime reacts with the copper to produce the jolt. 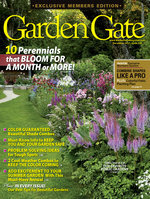 You can purchase copper strips and tape just for use in the garden. They’ll last for years, and you can reuse them. I like to use the strips around tender young plants, to give them a chance to get established. But you can use the strips around larger plants, too. Just be sure that no leaves touch the ground outside the copper strip, as slugs can use them as “bridges” to reach the rest of the plant. It’s a good idea to shine up your copper strips once in a while — research indicates that bright, shiny copper is more effectivethan strips that have begun to corrode. Want a cheap alternative to copper strips? I’ve also had good luck with copper pan scrubbers (like Chore Boy® brand) from the grocery store. 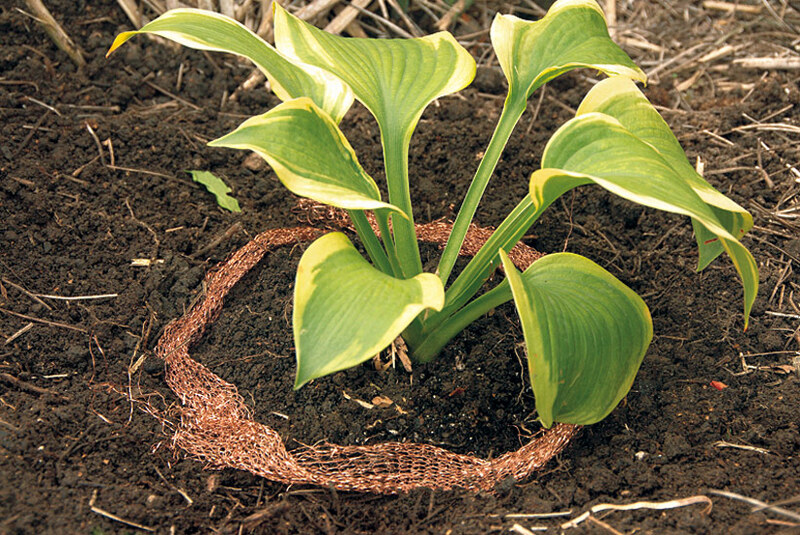 These copper mesh bundles can be pulled out into long, thin ribbons and pressed into the soil around the plant, as I did in the inset of the photo. (Pin them in place with landscaping pins if you’re having a hard time keeping them in contact with the soil.) When using these scrubbers, I think the sharp edges are just as unpleasant for the slugs as the copper itself. Make sure that the ends overlap so there’s no gap to let slugs in. Yes, I said diatoms. Diatomaceous earth, a white powdery substance, is made up of the crushed shells of fossilized diatoms, tiny hard-shelled algaelike plants. What does that have to do with slugs? Well, diatomaceous earth is abrasive. It creates tiny cuts in the soft underbellies of slugs and snails, causing them to dry out and die — no more holes in the hostas! 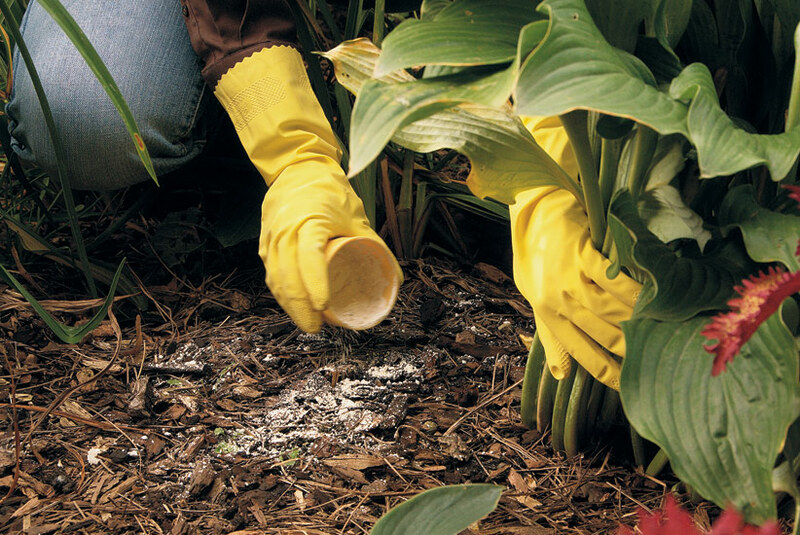 Lightly sprinkle diatomaceous earth under the dripline of hostas and other shade plants, just like you’d put cinnamon sugar on toast. Make sure you completely surround the plant with a 5- or 6-in.- wide band of diatomaceous earth. You’ll need to reapply it after rain, because it washes into the soil. Be careful when you apply it, though — you don’t want those tiny abrasive particles in your lungs, so be sure to wear a dust mask and gloves. There you have it. These four easy-to-use methods will keep slugs (as well as their better-protected relatives, snails) from doing their worst to your prized plants. And you won’t have to worry about storing poisonous slug bait in the garden shed, either!